How To Choose Violin for Beginners – Violin is a complex musical instrument and has a very melodious sound. But this instrument is not as popular as guitar or bass. If you’re interest and want to buy a violin, this time Music For Your Life will discuss about tips on how to choose violin for beginner. In how to choose violin, we must be careful not to become disappointed later. Buying and choosing a violin like looking for a wife, we must have a great commitment emotionally and financially. Each violin has its own uniqueness in terms of sound, comfort, and aesthetic. Can you imagine if buying a violin in a neat state in the case, it sounds not as we expected, or there may be cracks (cracks in the hidden). Money will be spent in vain. 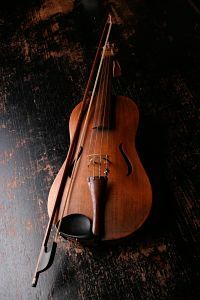 Basically a good violin is a violin that when played in a prime state (no cracks, nice body, no construction faults), and the most important is a good sound. Good sounds are subjective, some may like warm and sweet sounds, or dark and mellow sounds. It depends on your taste. How to choose violin ? Before buying a violin we must plan or think about the price range of the violin that fits our budget. Planning the price range avoids us to spend time looking for violins beyond our budget, as well as to quickly analyze the violin that fits our expectations. Keep in mind, cheap doesn’t mean cheap, expensive doesn’t mean good quality. This means more careful observation before buying. In addition you can also buy used violin. According to most violin players, the violin that often played his voice better. When buying a secondhand violin to note condition the violin as a whole, we will discuss in the next point. A good bridge located between the middle of the f-holes, as well as the shape corresponding to or parallel to the fingerboard, a good bridge will form the curve on the strings making it easier for us to swipe the strings and move the strings. See if there is a crack in the violin body, if there is a crack will make the sound becomes less good, the appearance is also less interesting. You need to check if the fingerboard touches the strings or not, if the fingerboard is too close to the string will make a rattle sound, if too far will make us difficult to press the strings. And check also whether comfortable when we shift hands in the neck, this is important because it related to shifting. Choose a violin whose wood has many year lines, if more lines of year then indicates that the wood is old, the older the sound the violin will get better. To check it we need to look into f-holes. Soundpost shaped wooden vertical cylinder, soundpost serves to deliver sound from the front fiddle to the back of the body, resulting in a solid sound. A good violin should not have a loud and shrill voice, at least choose a violin that has a distinctive sound character, but the sound quality is a violinist subjectivity. There may be a warm and sweet sound or a dark and mellow sound, it depends on your tastes and needs. Color doesn’t directly affect the sound of the violin. In choosing violin color is the subjectivity of the violinist, choose a color that suits your character and personality. Actually the color will affect our mood in play, or it can also show the character of the violinist. Next in how to choose a violin is adjust to your body size. Because it has fractional sizes ranging from 4/4, 2/4, 3/4 or at least 1/32. To find out we put the violin on the neck and hold the scroll with the right hand, if the elbow is left or bend then it is the right size. Well that’s tips in choosing a violin, preferably in choosing and buying a violin, an experienced person, a violin teacher, or a friend who is expert in playing the violin. May be useful.